Patrick Vanderwyden constructed this electric bike with a treadmill motor. He charges it with solar energy. Orlando, Florida (CNN) -- The massive oil spill in the Gulf of Mexico has triggered heated debate about where the United States gets its energy supplies. Some say domestic drilling is necessary to avoid U.S. dependence on foreign oil. Others say the country needs to look to other fuel sources. But one man has found his own solution. Patrick Vanderwyden uses solar power to run his water heater, hot tub, air conditioner, fans, and his refrigerator at his home of 24 years. Three years ago, the self-described New Age hippie began a personal mission to cut his energy usage by switching to alternative energy. "What I do now has an effect on future generations," said Vanderwyden, 49. "I don't want to leave future generations with a real problem if I can help it. And I think I can." With the help of these solar panels, Patrick Vanderwyden says he reduced his energy use by 30 percent last year, compared to 2008. The sun also powers most of Vanderwyden's transportation. On any given day the conservationist can be seen throughout town quietly driving something with pedals or an electric motor. He has a collection of recycled bikes, an electric cycle and one bike fashioned from spare parts that he calls "Frankenbike." Vanderwyden carefully drives the strange-looking contraption, powered by a treadmill motor, since it can easily exceed the top legal speed of 18 mph allowed for electric bikes, he said. He also has in his arsenal of alternative vehicles a Chevrolet pickup truck with an electric motor. 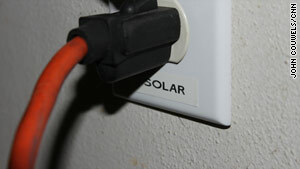 Vanderwyden's electricity is generated by his solar panels. Vanderwyden stumbled upon the truck for sale on the internet auction site eBay. It already had been converted by a New Jersey electric company. 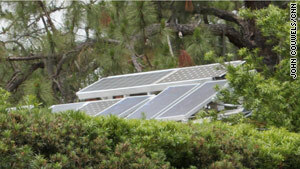 He says he reduced his energy use by nearly 30 percent last year compared with the year before. That's in contrast to worldwide energy consumption, which has continued to rise for decades. "What was started in the '70s was turned off in the '80s as far as the conservation and the use of renewable energy," said Vanderwyden. 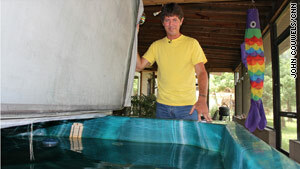 Vanderwyden shows his hot tub, which he fills with rainwater. The U.S. Department of Energy reports that demand for oil has almost doubled since 1970 and the demand will continue to increase for decades to come. Oil accounts for more than one-third of U.S. energy use. The Energy Department statistics show that in 2008, the vast majority of America's petroleum use went toward consumer vehicles, commercial vehicles and air travel. Fuel-efficient hybrid cars only account for a small percentage of cars sold today, although the Alternative Fuel Vehicle Institute predicted that by 2035, alternative fuel cars will account for more than half of the cars bought. Critics of electric vehicles point out that electricity is mainly produced by coal-powered plants which, in turn, create large amounts of greenhouse gases. Acknowleging that concern, Vanderwyden said he reduces how often he drives his electric pickup truck. Instead, Vanderwyden drives his electric bike charged from his solar panels as often as possible. The conservationist admits his actions are extreme but says if everyone would reduce their energy use a little, "all of us together would make an impact." "I'm sad about this oil spill, but at least it's bringing some attention to this issue again," he said. "I really hope that [it] gets people to understand that it's our demand that ... makes them want to drill a mile deep in the Gulf of Mexico."